In almost 24 hours I am going to be on live television. Seriously. While I may not have it all figured out just yet, I have decided that I will talk like Julia Child and only refer to myself in third person. Oh, and I have decided I am going to make Valentine’s Day treats. Considering VDay is on Tuesday, it seemed only fitting. 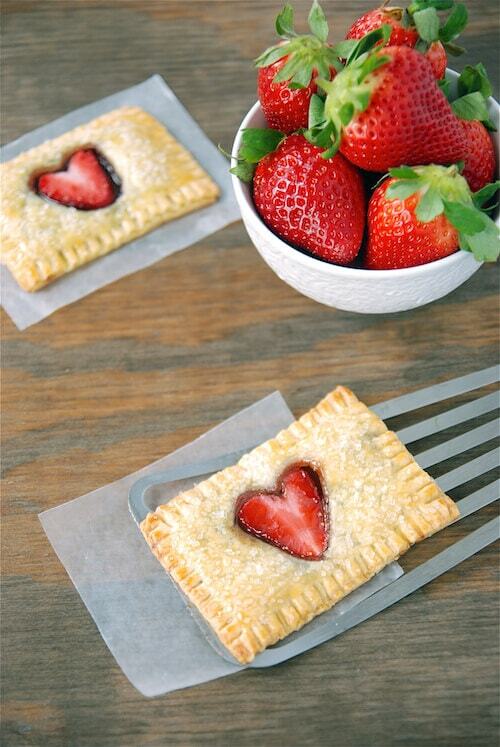 So for the first segment (Saturday, 8:50 am, GMJ- be there) I am going to make these Strawberry Nutella Poptarts! Aren’t they adorable? And you will never guess how easy they are…. First, take some store bought pie dough. Sure you could make your own, if you wanna be an over achiever or whatever. Roll out the pie dough till it’s pretty thin. Then cut it into 2.5 x 3.5 inch rectangles. On one pie dough rectangle, spread a layer of Nutella. Then spread a layer of Strawberry Jelly. Cut a strawberry slice into the shape of a heart (slice a strawberry lengthwise into slices and then curve out the stop with a paring knife to create the heart shape). 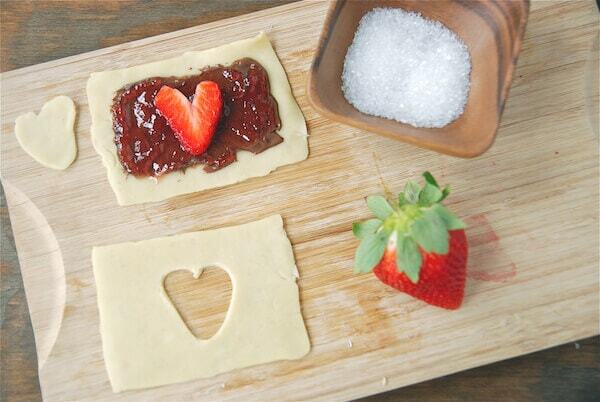 Using the strawberry heart as a pattern, cut out a heart shaped hole in the second piece of dough. 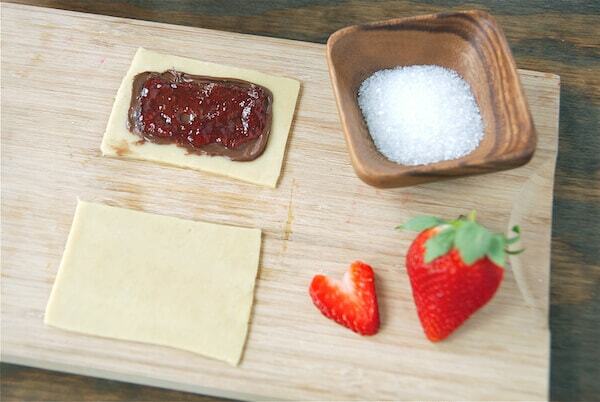 Place the strawberry in the center of the nutella/strawberry jam mixture. Top with the second piece of dough with the heart shaped whole. Using a fork, seal the edges. Brush the pie dough with an egg wash (1 egg yolk + a splash of quality H2O –any Waterboy fans??) and then sprinkle the top with a heavy dose of coarse sugar. Bake at 350°F for 12-14 minutes, or until golden brown. Let cool 5 minutes and serve! So now that you already know what I am going to make, are you still going to come watch me make a fool of myself? If they don’t throw me out after the first segment (at 8:50 a.m.), I will be making Red Velvet Cupcakes at 9:50 a.m. So if any of you are in Jacksonville, or the surrounding areas, make sure and DVR me (we both know you won’t be up that early on a Saturday). If you aren’t, don’t worry! There will be clips posted online…and I promise to share them as long as you promise to laugh with me –not at me– when I drop everything, cut off a finger and get bleeped out on live tv. 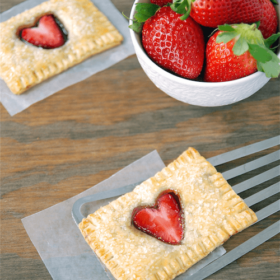 These Strawberry Nutella Poptarts are a snap to put together and would make the perfect Valentine’s Day breakfast in bed for the kiddos…or your lover! Preheat oven to 350°F and cover a cookie sheet with parchment paper or a silpat mat. In a small bowl, whisk together egg yolk and 1 teaspoon water. Set aside. Roll out pie crust till it’s pretty thin (about 1/16th of an inch thick). Cut into 2.5 inch x 3.5 inch rectangles, re-rolling the dough as needed. You should end up with 12 rectangles. 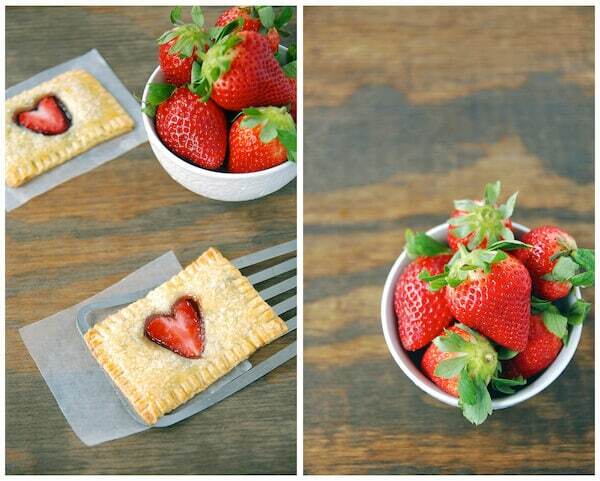 Take 6 of the rectangles and cut out a heart in the center, using the strawberries carved into hearts as a guide. Set aside. On each of the 6 remaining rectangles, spread 1 heaping teaspoon of Nutella, leaving a 1/2 inch border around the edges. Then top the Nutella with a layer of strawberry jam, again making sure to leave a 1/2 inch border. 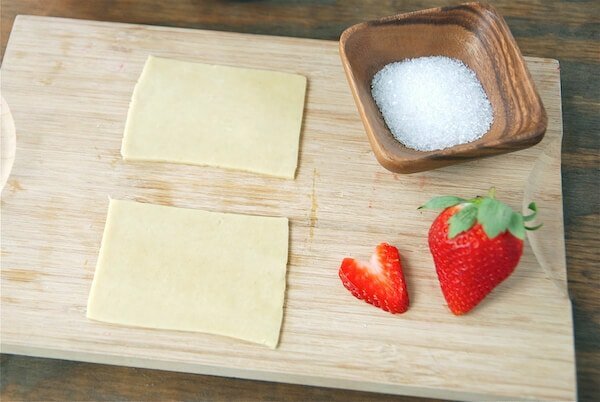 Place a strawberry carved heart on top of the strawberry jam layer, in the center of the rectangle. Top with the pie dough with the heart carved out of the center. Seal the edges with the prongs of a fork and brush with egg wash mixture. Sprinkle heavily with coarse sugar. Bake for 12-14 minutes, or until golden brown. Transfer to a cooling rack. Let cool for 5 minutes and then serve! I was JUST in my fridge looking at a roll of refrigerated pie dough wondering what to make with it. And I just so happen to have Nutella, strawberry jam AND fresh strawberries as well. It’s like these were meant to be in my kitchen right now. To turn on the oven at almost 10pm?? Tempting. No way- sooooooo cute! Good luck- you’ll be great!! These are so awesome looking. Do you mind if I link them up in a Valentine’s Day roundup I’m doing? Goodluck on Saturday! You’ll do fab!! Yuuuum!!!! I looove pretty and delicious food! I die, I die, I die! NEED THIS!!! Please post the TV clip?! Hope you post a link of you TV awesomeness! Beautiful and delicious at the same time! Great recipe! Please post your TV clip and be yourself! these look so delicious. Good luck, you’re going to be great!! 1) Congrats on the TV gig! 2) Good luck! And please post the video. 3) Super cute pop tarts. That’s so exciting!!! Good luck my dear, you’re doing to be amazing – no doubt about it! ps. omg those are the cutest things ever!! How fun are these! Good luck on TV, I know you’ll be great! Lots of things to say! 1. These are so ridiculously adorable, I might pee! 2. Congrats on the TV debut! You’ll do soooo good! I just know it! 3. Let’s drink mimosas and pop xanax afterwards to celebrate! Wayyyyyyy cute! My sister banned poptarts from her house a while ago because of the HFCS. I’m going to make these for my niece and nephew, I think their heads might explode! Wow they are amazing! Such a great idea! You’re going to be AMAZING. Just don’t burp. Or do! Then it will relax you? 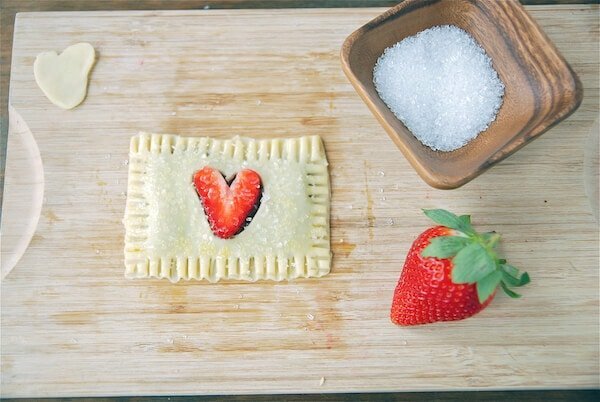 Your pop-tarts look soooo good, its hard not to run to the kitchen and make some immediately. Can’t wait to see you on TV, I bet you’re a complete natural! The poptarts are so innovative! I love it. And it’s so easy! And you’ll be fabulous on tv! No doubt about it. Girlfriend you have outdone yourself! These are adorable! Again, magazine worthy. 🙂 I hope your tv segment went well!!! Just be yourself and you’ll be great…people will love you and you will be famous! 🙂 Have fun! And Um….my husband would do just about anything for one of these. I thin I ought to consider how I can barter…assuming I could tackle this one. AHHH!!! This is SO major! You’re a rock star/celebrity. For sure. And you’re a POP TART with NUTELLA celebrity. That’s like…golden. These look delish! Good luck on the show! Oh, MY! Congratulations! I am SO thrilled for you! These are terrific and I know you’ll be spectacular tomorrow! Good luck on the TV gig! These are super creative and super adorable. Can’t wait to see the clips! These poptarts are seriously brillant!! So, so cute! I love them!!! These are so cute and easy! Definitely making some of these for the kiddos and hubs. Grats on the tv spot!! I’m thinking we won’t be able to see it out of your area though, so I’ll have to wait for the clips. Congrats, Jessica! I just watched your video feed, and I think you did great. What great exposure for your lovely blog. If I was asked to do the same I think I’d freeze. I’m not comfortable with being photographed. You pulled it off like a pro. These are quite adorable, and certainly very easy to make. I’d love one…or two. Okay, three, of these. I’m so sad I won’t get to see you on TV! I saw this recipe yesterday, and have been dreaming of it since! I can’t wait to get to try it! Congratulations, Jessica! I also watched you and you were terrific! I think you did a GREAT job and your pop tarts are stunning! BRAVO, girlfriend! Oh Jessica! We just bake these tarts OMG!!! They are delicious! We used puff pastry sheets and the result was fantastic. My fellow chef at home (my 13 years old daughter) helped me and she used a heart cookie cutter to make the hearts in the tart and also to cut the strawberry hearts (her idea). Thank you again for the recipe, I’ll watch your video later. I love the idea of using puff pastry!! I wish I could get your local TV Station, I’d definitely be watching. Hoping the segments went well. Your pop tarts look delicious. So cute and easy! I’m sure you were great and I hope you link to the video soon! Made these for the family this weekend and it was all we could do NOT to eat them all at once! =) Yummy and super cute! Thanks so much for sharing the recipe. These are wonderful! I made them, but with nutella and banana and another with peanut butter and banana (with honey on top) because my friend doesn’t like strawberries and I only had banana’s on hand. There were fast, easy, and super tasty! A fantastic recipe!! I’m making the strawberry ones for myself next time! Ohhh yum! I can just imagine how good they must have been with nutella & banana! Just served these to my six kiddos in celebration of Valentine’s Day and they were a HUGE hit! We are all smitten. Seriously. Hope your t.v. segment went wonderfully! So glad they all liked them! I would never have to thought to make home made poptarts….which i’m sure surpass the store bought ones ten fold. I’m super excited to try these. These are amazing! So easy, but so yummy and cute! Congrats on the show! I am not sure they would go from the freezer to the oven well. I know you can freeze pie dough…but when it’s filled and brushed with egg wash…I’m just not sure it would taste right. You could always try it out though! You never know! I made these for myself and my boyfriend over the weekend and they came out fantastic!! I did one batch with just strawberry and I think we prefered those the best. I can’t wait to try other flavors like blueberry and raspberry!!! Thanks so much for sharing this great recipe!!! I do not think the would do very well frozen. But if you try it, let me know the results! Love these! Can they be frozen at all because I would love to bake them and then pop the into the microwave in the mornings for my girls! OMG these look absolutely amazing! I’ve always been a poptart fan, but wow these are like a dream. I can’t wait to surprise my wife and kids with these…it will blow them away. Thanks for sharing. To be honest, they really are best fresh and warm out of the oven. They do not keep very well. However, you can put them together the night before and refrigerate them till the next morning. Then all you have to do is pop them in the oven! i reroll pillsbury pie dough all the time to make mushroom turnovers and just did it to make these as well – worked fine. i managed to only have to make two from rerolled dough as i sort of squared it off as i rolled it thinly. i didn’t add any jam or fruit, used a bit of leftover french toast egg mix as the wash and had turbinado sugar. they are delicious!!! It looks so delicious and cute!! I woke up early this morning (Valentine’s Day) in order to bake these for my sweetheart before his 9 am final exam. He gave me the hugest hug before he even tasted them! We even packed a second pop tart for him to bring as a snack during his test. Great quick & easy recipe, especially for Valentine’s Day morning! Thanks for all the wonderful recipe ideas! I made these this morning for my husband for Valentine’s Day & they were delicious!! They were also very pretty until they fell apart when I tried to pry the bottoms loose from the tin foil I cooked them on. Next time I’ll try parchment paper underneath like pictured in the recipe. But overall, they were a success! Thanks for a great recipe. I just made these for my hubby. He loved it. Mine was soft from the bottom. How to avoid that? I used foil on the bake sheet, 350 degree oven for 15 mins, and 5-10 min on cooling rack. Do suggest what I can do different so they are crunchy (light brown) on the bottom as well… otherwise these were heavenly. This teenage spanish website, took your recipe and never gave you the credit for the photos, and you are not the only person who they take there articles, recips, diys, etc. It makes me mad to see these type of actions happening. Pingback: LA FRESA | Compartimos un brunch? Pingback: Bridal Shower. | Small things. Love this! I am having a tea party, combination proper and Mad Hatter. These will be the perfect representation for the Queen! Sorry about that, but I’m sure you can understand that autocorrect gets the best of all of us and I have to be my own editor. Thanks. Ever thought of rolling the coarse sugar into the pie dough as opposed to sprinkling on top? Might offer a more cohesive sweetness. Thanks for continuing to share this pop tart recipe that I found on Pinterest. My kids loved them for breakfast this morning. We love these! You should submit a photo of these for our $350 V-day recipe photo contest! Pingback: Warm Vanilla Sugar | Valentine’s Day Treats! HI! I am making a bunch of my moms favorite sweets and sending them to her in a super cute care package for mothers day. Searching for strawberries and nutella, I came across this recipe. Im curious, will these last wrapped up carefully in a two day shipment? Hi Kara! These are best eaten fresh and warm out of the oven. I wouldn’t recommend mailing them. Thanks! I knew it was a long shot but I still had to ask 🙂 Gonna bake ’em today. Cant wait to see how they turn out. These are absolutely darling! Strawberry season is almost in full swing, and I’m definitely going to try these! I tried these on a lark and they were scrumptious! Thanks! OMG I LOVE YOU for this recipe!!! Dis-aster. The bottoms did not get baked all the way. Edges were not as clean and cute as the photos. Strawberries dry up and shrivel in the oven. The nutella drips down the front if they are not dried enough before placing in the cute little sugar bags I bought. And the egg wash eh. I used water and egg white, but it dis-solved the colored cute sugars.